" You are that handmaid chosen by God and in whom there is no venial, mortal, original or actual sin, nor any other form of sin is found in you: and you see why Adam was created pure and without sin. THere are some who say that you, Mother, are touched by original sin and they are saying a wicked thing since it is said above that my Father chose you because of your purity before Adam was created, to incarnate His Son. Thus, if you had been touched by original sin, our mother Eve could say that she was made purer without any stain of sin: this is why, glorious Mother, infidels who accuse you of such a stain are silenced"
-- from Dialogue of Holy Wednesday, S. Peter Paschasius, O. de M.
"God wanted to preserve you from original sin which is mortal and from any other harm of pollution. God's grace did tat since, as it was prophesied, the one who was to be born of this flesh had to be noble, the noblest of the sons of men. Original sin came in man through disobedience, incurring the wrath of God who said: I regret having made man. 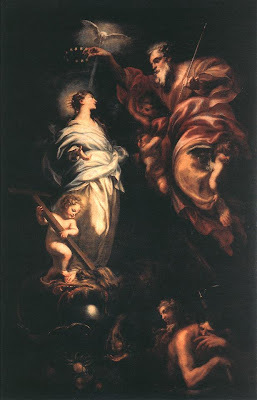 Therefore, if the Virgin Mary had been conceived in original sin, we would have to say that at some point she incurred God's ire, something which we do not want to say or believe; instead, before and after her conception, Mary remained in God's grace and love. 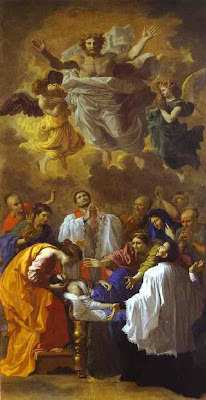 God did that, by a special grace, as God did with the three youths placed in the furnace to burn"
-- from the Dispute of the Bishop, S. Peter Paschasius, O. de M.
Today, my friends, is the Feast of St. Peter Paschasius, Bishop and Martyr. He is the Patron saint of all Mercedarian Students. Because of the Sunday, his Feast was "bumped". Nevertheless, it is worth remarking and calling to mind the zealous example of faith given to us by this man. The son of devout Mozarabs, Peter Paschasius was born in Valencia in 1227. Peter Nolasco and his brothers knew young Peter’s family and they stayed at their house near the Gate of Valldigna when they were on their way to a redemption. Peter Paschasius started his ecclesiastical career in his native city and he completed his studies at the University of Paris. Upon returning to Valencia, he was honored with the post of canon of the cathedral church. Soon after, he left his post to join the Order of Mercy and he received the habit in the Valencia Cathedral at the hands of Arnaldo of Carcassonne in 1250. He traveled to Rome in 1296 and Pope Boniface VIII appointed him bishop of Jaén. On February 20, 1296, he was consecrated by Cardinal Mateo de Acquasparta in Saint Bartholomew’s chapel of the island on the Tiber. Later, when he was making a pastoral visit to his Jaén Diocese, he was attacked and taken captive to Granada by the Moors of that kingdom. While in jail, he wrote in Provençal: Dispute of the Bishop of Jaén with the Jews and Refutation of the Mohammedan Sect, two very interesting works with apologetic content to provide Christian captives with arguments against the proselytizing sermons of the Jews and Moslems. Peter also wrote: The Book of Gamaliel dealing with Christ’s passion and death, The Destruction of Jerusalem, Treatise against Moslem Fatalism, The Gloss on the Pater Noster and The Gloss on the Ten Commandments. This learned Mercedarian doctor has the honor of having publicly defended the Immaculate Conception of the Virgin Mary in Paris and in his work, Life of Lazarus, written in 1295, long before any other Western theologian. Several times, his fellow redeemers sent him the ransom money but Peter preferred to have other captives recover their freedom instead of him. The fifty years he had been wearing the Mercedarian habit had left a Mercedarian imprint on his soul. On December 6, 1300, while he was still wearing the vestments he had used to offer Holy Mass, he was beheaded in his dungeon. He was buried in the place where the prison was and where he died. Christians called this place, Martyrs’ Hill. Peter’s written works constitute a valuable legacy of the Order of Mercy. 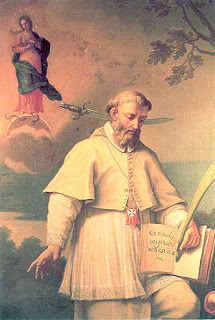 Some Mercedarian writers like Manuel Mariano Ribera, 1720, Juan Interián de Ayala, 1721 and Peter Armengol Valenzuela, 1901, have defended the religious status and the Mercedarian profession of this distinguished bishop of Jaén. His works were compiled and published by Fathers Bartolomé de Anento, 1676 and Peter Armengol Valenzuela, 1905-1908. There is a painting of this saint depicting him offering the Mass before his martyrdom. What is keenly remarkable about this image is that the acolyte for his Mass is the Christ-child, Himself. So the say goes, as faithfully and devoutly did he serve Me, so now, in his last act of love, I shall serve him. It is a lesson of humility for us all... a lesson of Faith, Hope, and Charity. Our friend over at this blog has announced breaking news in the diplomatic front. The Holy See and Russia are on possibly on the verge of entering into full diplomatic relations. What a great thing!!! 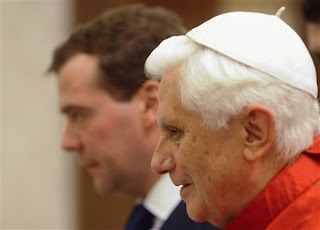 Since the ascent of the Russian Patriarch to the See of Moscow, it has been more than a notable occurrence of improved and friendly relations between the Holy Father and the Patriarch of Moscow and All Russia. Perhaps, some may have considered the Cold War over between the West and the Soviet Union, yet that war -- though on another level -- was still being waged well into the 21st century. Now, by God's grace, politically and spiritually Russia and Rome are speaking. Let us pray for the Unity of the Church, but not, as von Hildebrand warns us, at the expense of the Truths. Let us not fall into irenicism (i.e. false ecumenism), but remain steadfast in Faith, Truth, and, above all, Charity.